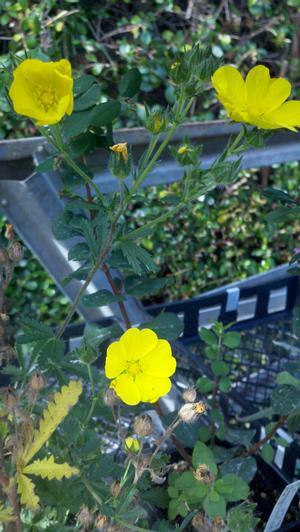 Upright, or slender, cinquefoil is an evergreen perennial that's native to California. It forms a mound of soft, dark green foliage about 8-12" tall. Simple sunshine yellow flowers bloom on upright slender stems in late spring - early summer. The name cinquefoil comes from the French for "five leaves" and refers to the compound leaf which has five deeply divided lobes. In its naural habitat, slender cinquefoil's typically found in meadows at elevations between 390-3,575 feet (120-1,100 meters). It has a wide distribution across California including the north west Klamath ranges, northern Outer North Coast Ranges, north-western California, Cascade ranges, high Sierra Nevada, Transverse ranges and Peninsula ranges and into Oregon and Nevada. Slender cinquefoil is an evergreen perennial. The soft, dark green leaves are palmately compound i.e. each leaf consists of five deeply divided leaflets somewhat resembling a hand. In cooler climates, slender cinquefoil will tolerate full sun. However, it will be happier planted in a spot that only receives morning sun, or is lightly shaded all day. Slender cinquefoil is tolerant of many soil types. It'll be happiest in a freely draining loamy soil. However, it's tolerant of clay as long as the soil's not permanently waterlogged. Slender cinquefoil seems to be quite an adaptable plant in terms of its water needs. In the wild, it's typically found growing in moist soils, so it certainly won't be unhappy if you plant it in an area where it receives overspray from lawn sprinklers. We've been growing it in our garden in Soquel (just south of Santa Cruz) since 2006 and have watered it just twice! On the coast and areas with relatively cool summers, slender cinquefoil should survive with no summer water. However, it will bloom longer and look better with an occasional deep watering. 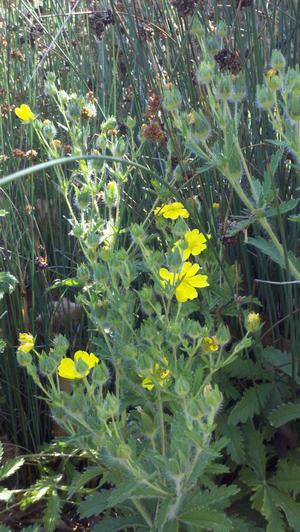 In hotter inland areas, slender cinquefoil loses water faster as it's leaves are relatively large and soft. Therefore, it needs to be watered more frequently than in milder coastal or mountain climates. We've been growing slender cinquefoil in the garden since 2006 and haven't had any pest and disease problems. The flowers of slender cinquefoil provide pollen and nectar for native bees. Slender cinquefoil is a good container plant for lightly shaded patios and decks. Good California native container companions might include Juncus textilis, alum root (Heuchera spp. ), wild ginger (Asarum caudatum), Tomales Bay fescue (Festuca idahoensis 'Tomales Bay') and modesty (Whipplea modesta). Alternatively, try the Australian native grass-like dianellas or mat rush (Lomandra spp) for a vertical element in the container. The long blooming season of slender cinquefoil adds a splash of color to shady planter beds or rock gardens. It also looks at home along dry creek beds. Its tolerance of moist soils means it also works well near water features. Upright cinquefoil needs very little maintenance. Just cut off the flower stems at the base when the plant's finished blooming.